Biotinylated Human LAIR-2, His Tag (LA2-H82E4) is expressed from human 293 cells (HEK293). It contains AA Gln 22 - Pro 152 (Accession # Q6ISS4-1). The protein has a calculated MW of 17.8 kDa. 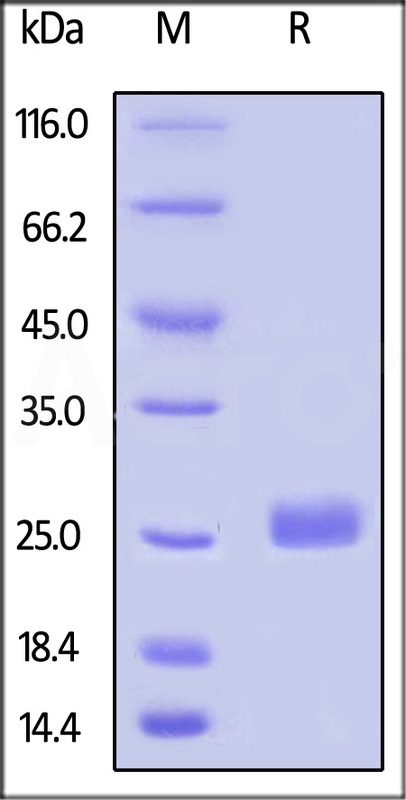 The protein migrates as 25-28 kDa under reducing (R) condition (SDS-PAGE) due to glycosylation. Biotinylated Human LAIR-2, His Tag on SDS-PAGE under reducing (R) condition. The gel was stained overnight with Coomassie Blue. The purity of the protein is greater than 95%. Leukocyte-associated immunoglobulin-like receptor 2 (LAIR2) is also known as CD antigen CD306. LAIR2 contains one Ig-like C2-type (immunoglobulin-like) domain. LAIR2 is a member of the immunoglobulin superfamily and was identified by its similarity to LAIR1, an inhibitory receptor present on mononuclear leukocytes. LAIR2 / CD306 is thought to be secreted and may help modulate mucosal tolerance. (1) Meyaard L., et al., 1997, Immunity 7 (2): 283–90.